This fiery class will get you moving. A fun, well-rounded, carefully sequenced flowing yoga class with careful alignment detail, with plenty of core work and challenges. You will need two blocks and a strap. A hot but steady flow to get your inner fire stoked. This practice hits all the sweet spots for when you have less time but still want as full a practice as possible. Includes lots of lovely chest, shoulder and side body openers as well as twists, hip openers and balancing poses. Perfect for when you need a little extra energy for the day ahead but still need to feel very grounded. This first sugal detox class balances the metabolism to give a natural boost instead of a sugar ”˜high’. It’s full of juicy twists and forward bends and a perfect 15 min booster for a mid-afternoon low. Instead of reaching for that sweet snack try this sweet yoga class. You may like to use a bolster and have a chair handy and you may need a block and a belt. Revolution from the inside! This third level of the sugar detox series includes breath work (pranayama) and some more advanced poses, all focusing on twisting. The twists detoxify and focus on an inner cleansing and digestive health. For relaxation you may want to use a bolster and you may need a block and a belt. Increase your empowerment, your brightness, your clarity through this creatively sequenced Anusara inspired vinyasa yoga class. This class is a beautiful reminder of our own empowerment and ability to transform how we can feel through our yoga practice. 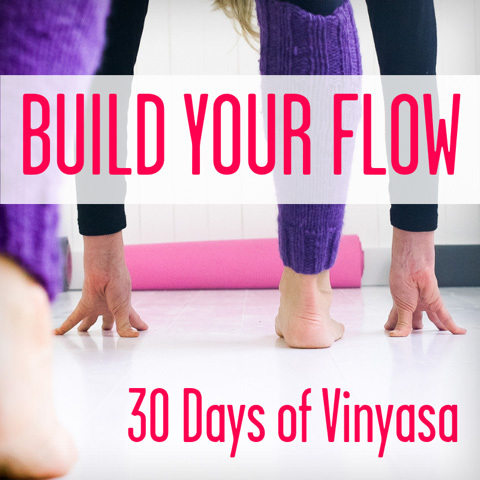 A beautifully sequenced, alignment-focused vinyasa yoga class which reminds us of having fun with yoga and physically embodying our personal power. First in Your Intelligent Body Series: a sequence designed for beginners and those with inflexible spines to open up their back body - great for those with tight hamstrings, tight upper back or shoulders. This may work for those new to yoga, but also if you're an athlete or spend the day desk-bound. We recommend that you practice this sequence every day until you feel more freedom and release in your spine. You will need a couple of blocks, blankets or cushions and a chair/sofa handy. This yoga class teaches us how to transition through change in life, big life changes or the changes which touch us in every day life. This class will have you surfing on your ocean breath and enjoying moving through and greeting change head on. This class is dynamic, but you are encouraged to spend time in transitions and enjoy the process of transitioning, rather than the destination. A strong hip focus and plenty of creative, fun variations on the usual poses. You will need a rolled up mat or a block and a strap. A fast-moving yoga class which takes us to the edge of expansion and creativity, taking us to the edges - the polar opposites of the connection to life as 'always becoming' and experience life as 'always being'. A swift, heated sequence but with holding energy. Plenty of lovely creative sequencing, lots of strength, twists and fun. You may need a block and a strap. 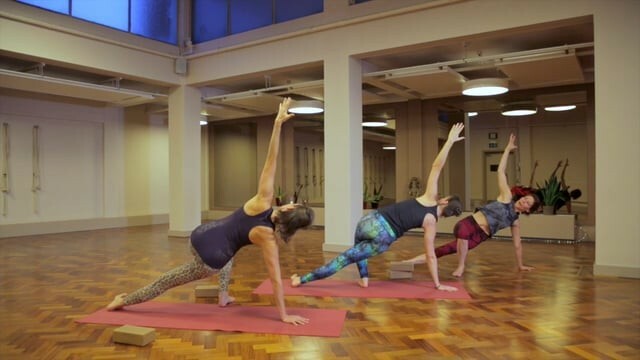 In this short tutorial style class Bridget shows us some simple exercises for harnessing inner strength, energy and vitality. The class focuses upon Jalandhara Bandha, which controls the flow of energy in the throat and blood vessels of the neck. This has the effect of stimulating the thyroid and parathyroid and balances the endocrine system. You will need a strap and some blankets for shoulderstand. In this yoga class Bridget continues the theme of giving inner strength and courage as well as a physically strong core through core strengthening asana, abdominal exercises as well as penty of breath practices to bring you into your core and to harness your courage. You will need a block. 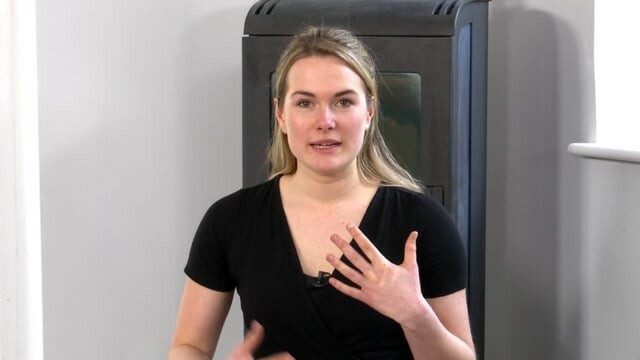 In this tutorial style class, Bridget shows us how to get ooodles of inner strength by activating mula bandha, the core and strengthening the pelvic floor. This yoga class shows correct pelvic alightment in warrior variations and then goes onto plenty of core strengtheners. You will need a block. This knee clinic is suitable for teachers and those who are interested in keeping healthy knees and correct knee alignment during yoga poses. LeIla uses body rolling tecniques to demonstrate ways of keeping stabiltiy and space within the knee joint. You will need a body rolling ball.